Today I want to share with you some tips on finding household cleaning products that are both child and environment friendly, and some even wallet friendly! If you never considered switching from your harsh chemicals - consider this: hazardous chemicals in typical cleaning products are linked to asthma and a concotion of chronic illnesses, not to mention that according to the EWG (Environmental Working Group) recent study, babies are born polluted with many of the substances found in those products. If you want to go easy on the wallet try these natural ingredients for basic household cleaning, they might not stink the same as your Clorox, but they get the job done! 1. Baking Soda: all-purpose cleaner. Cleans, deodorizes, removes stains and softens fabrics. 2. Lemon Juice: Cuts through grease and removes perspiration and other stains from clothing. A bleach alternative. 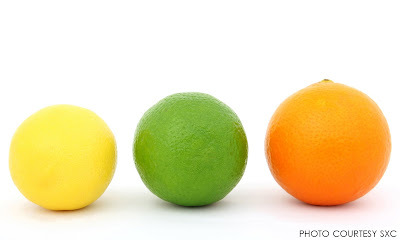 Overall, citrus can be a great cleaning/deodorizing agent. 3. Vinegar: Cuts grease, removes stains and is an excellent water softener. 4. Castile and Vegetable Oil based soaps: cleans everything. 1) Vinegar and Salt. Mix together for a good surface cleaner. 2) Baking Soda. Dissolve 4 tablespoons baking soda in 1 quart warm water for a general cleaner. 3) Baking soda on a damp sponge. Baking soda cleans and deodorizes all kitchen and bathroom surfaces. 4) Use liquid castile soap and baking soda in different ratios. Use a little soap and soda with lots of water on floors, walls and counters. Use more soap + soda for tubs sinks, cat boxes, anything that can be well rinsed. 5) For a general, all-purpose cleaner, try a paste made from baking soda and water or mix salt and water with a little vinegar. 6) 3 tbsp. vinegar, 1/2 tsp. washing soda, 1/2 tsp. vegetable oil based liquid soap, 2 cups hot water. Mix ingredients in spray bottle or bucket. Apply and wipe clean.